Kampilan – According to Filipino history, the Kampilan is believed to be the sword that struck down the famous explorer, Ferdinand Magellan at the hands of the legendary Chief or Datu, Lapu Lapu. However, there is no historical proof of exactly how he died in that particular battle or if he even went “hand-to-hand with Datu Lapu Lapu. Dual pointed with a carved hilt, these swords of the Sulu of Mindanao are carried by warriors who are in the first line of defense. The Kampilan is considered as the national weapon of the of Sulu & Mindanao areas. History shows a single swinging motion (like a baseball bat swing), can chop two or even three heads clean off depending on the fighting skill levels of the Kampilan wielder. Which is exactly what these swords were originally designed to do. It is believed to be the longest traditional sword ever carried by the Filipino warriors to date. The Kampilan is the most documented swords by the Spanish Conquistadors during their occupation of the Philippines from 1565 to 1898. 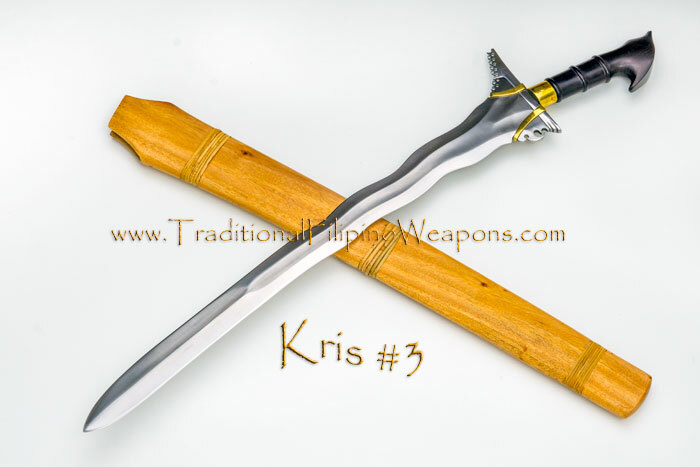 The Kampilan is a heavy double pointed sword with a rich history in the Philippines. As maintained by tradition, the Kampilan is about 36″ to 44″ with a carved reptilian shaped jaw bone hilt with a single edge. Kampilans were widely used as “head-hunting” swords on enemies in the southern Philippines. The handle, being shaped like a jaw of an alligator gives this sword a very unique appearance. Nobody is really quite sure whether the serpent on these weapons represents an alligator, a crocodile, a dragon, or a snake. Bakunawa (a mythical creature known to eat the moon), or other mythical Naga (Baybayin word for a deity or class of entity, taking the form of a very great snake or serpent). The true history is confusing; the best weapons experts in the Philippines (and other countries) continually categorized the dragon-like hilt as a crocodile or an alligator as fact. In the past, strands of hair are attached to the pommel of the handle for a more appealing as well as a more intimidating look. This is one dangerous sword in the hands of a skilled Kampilan wielder. 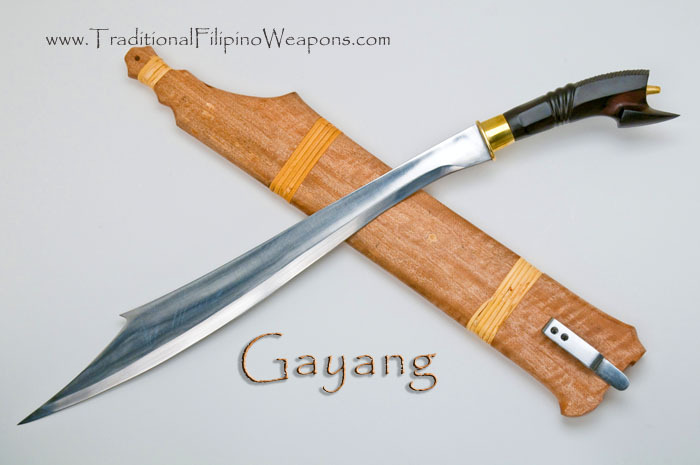 Despite its size, like many Filipino swords, the skills come from the deceptive fighting methods found in the Philippines. 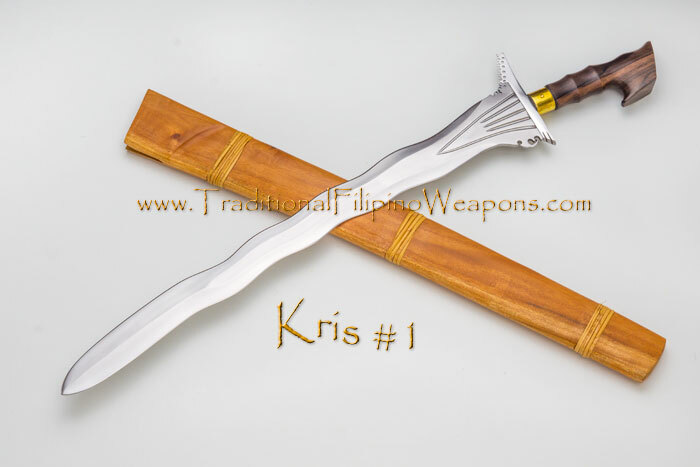 Like all old style Filipino swords, the Kampilan is what makes that particular Philippine indigenous martial art style unique. There is what is refereed to as a commoners Kampilan also in the Philippines. And they were very skilled with the Commoners Kampilan also. Speculation has it the Laring, and the Gayang may be spin-offs of the old style Kampilan going back to the days of Lapu Lapu. There is no accurate proof on that right now so we will not say one way or another. We have to admit, it sure looks like a spin-off. 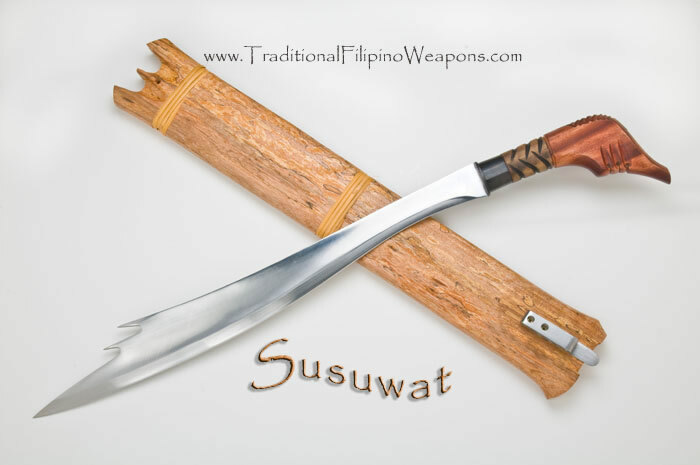 However, Ron Kosakowski is continuing to research to find out the true facts on this rumor along with any other rumors behind Filipino weapons.